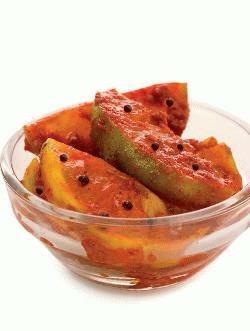 Recipes of different types of pickle like Mango, chilly, vegetable and lemon are given here. A pickle is an edible product which is tasty and spicy. People in Kerala love to have different types of pickles like mango pickle (kaduku manga), lemon pickle (narenga achar), mixed vegetable pickles and all along with their meals and are their favorite. A pickle is an edible product which is tasty and spicy. It has been preserved and flavored in vinegar solution. 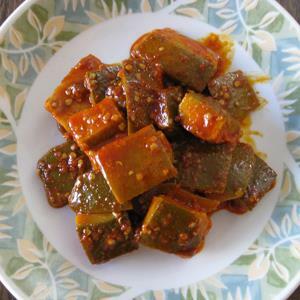 People in Kerala love to have different types of pickles like mango pickle (kaduku manga), lemon pickle (narenga achar), mixed vegetable pickles and all along with their meals and are their favorite. This recipe is very easy to prepare in houses and can be preserved for many months. 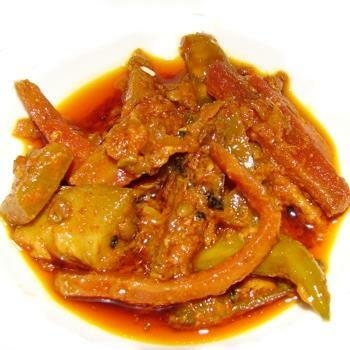 Kerala is also best in preparing mouth watering pickle recipes using fish and meat. There are many other pickles which are used by the people in Kerala like cauliflower, pumpkin, tomato, onion, carrot, amla, ginger, mushroom and many more. If you follow the steps given below, then you can prepare the best pickle ever. Wash the raw mangoes thoroughly and dry them up. Cut them into small pieces after adding suitable amount of salt and keep it aside for 6 to 8 hours. Take the salt water from it and strain it after boiling it. When it cools add mustard gram, fenugreek seeds, red chilly powder and salt. Mix it and put the masala in these pieces. Now heat the oil and add Mustard seeds, Asafoetida (hing) and turmeric powder and let it cool. Finally mix the raw mango pieces and preserve it in sterilized bottles. Wash the chillies thoroughly and cut the chillies into small pieces. Put salt into it and keep it aside. Take the salt water from it and strain it after boiling it. When it cools add mustard gram, fenugreek seeds, and salt. Mix it and put the masala in these pieces of chilly. Now heat the oil and add Mustard seeds, Asafoetida (hing) and turmeric powder and let it cool. Finally mix the raw mango pieces and preserve it in sterilized bottles. •Vegetables:Carrot, Cauliflower, Green peas, Beet root, Raw mangoes, Ginger, Lemons, almond, Green chilli and other vegetables if you like. Wash the vegetables properly and cut them into pieces. Blanch it for 5 to 7 minutes. Heat the oil and add mustard, fenugreek, turmeric powder and chopped onions into it. The onion should be fried properly before mixing it and then remove the vessel from the gas. Add all vegetables and mix it properly along with the prepared masala. If needed, you can add some acid ingredients to make it more lasting. When it is completely finished, fill it in sterilized bottles and have it after some days. Wash all the lemons properly and take the juice of 1/4th of the total 1 kg lemons. Cut the rest of the lemon into small pieces. Mix the juice and the cut pieces together. Now add red chilli powder, turmeric powder and salt. Mix it thoroughly and heat it in oil for a while. Also add mustard and asafetida. Fry the mustard seed and fenugreek seed in this oil and allow it to cool. Mix it properly with the lemon pieces and fill it in sterilized bottles.